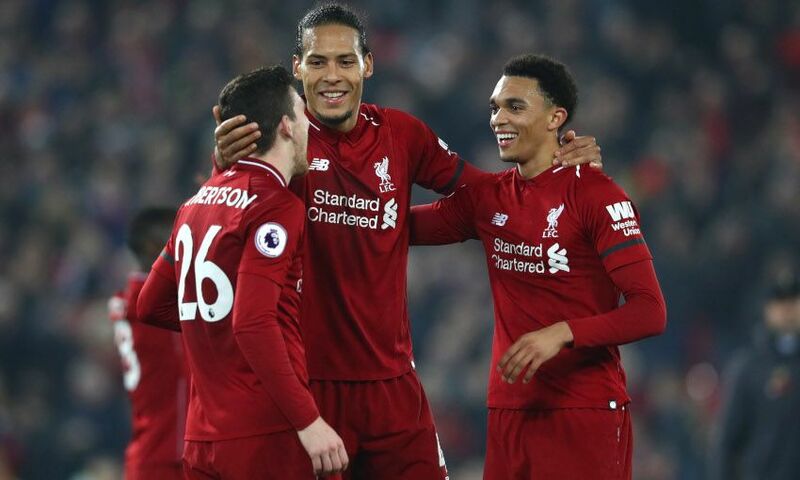 Virgil van Dijk admits he’s been showing Andy Robertson and Trent Alexander-Arnold some tough love this season in an attempt to encourage them to improve even further. The centre-back has described the duo’s form so far this campaign as ‘outstanding’, but believes they’re both capable of becoming even better. Van Dijk told Liverpoolfc.com with a smile: “They are having outstanding seasons and I am always a bit hard on them because I want them to do very well, like Robbo always says in the media! But I am enjoying every bit of it, seeing them perform like this. “They are fantastic players, full of confidence and they should be full of confidence because they’re performing at such a high level. I said to Robbo the other day that he needs to get some goals as well to be even better, but that’s just me wanting to push him to improve even more! Robertson and Alexander-Arnold claimed an assist apiece for Van Dijk’s recent double against Watford at Anfield. Afterwards, footage of Van Dijk playfully shoving Robertson as they celebrated the Reds’ fifth goal went viral among supporters. “I saw that as well! It’s just me and him always joking,” the Netherlands captain laughed. A collective effort is something Van Dijk is always eager to talk up. Liverpool are currently on a run of five clean sheets in all competitions – while Alisson Becker has kept an astonishing 17 in his 29 league appearances since arriving at the club last summer. That's why, therefore, Van Dijk feels the praise for such a statistic should be shared around. “100 per cent [it’s a collective effort],” the No.4 stated. “Robbo is having a fantastic season, Trent has been amazing and Joel has come in for the last few games and been playing very well. “It’s very important that everyone is getting to their best level, especially for the last nine games. “It’s obviously very important, especially with the games we have left and the situation we’re in, it’s good to have something to build on. Liverpool will aim to stretch their current shut-out sequence to six matches when Burnley visit Anfield on Sunday. Does Van Dijk feel such defensive stability provides the rest of the team with confidence? “Hopefully,” he replied. “That should be the case, but we have to keep doing it.